Listen to "Words Can Change Your Brain" on your iOS and Android device. Sometimes it feels as if the more we talk, the less we are heard. But in groundbreaking research, Andrew Newberg, M.D., and Mark Robert Waldman have discovered a powerful strategy called Compassionate Communication that allows two brains to work together as one. In twelve clear steps, Compassionate Communication actually changes our brain structure - as well as the brain of the person we are talking to - in a way that helps establish a bond between people. In this unique state - free from conflict and distrust - we can communicate more effectively, listen more deeply, collaborate without effort, and succeed more quickly at any task. 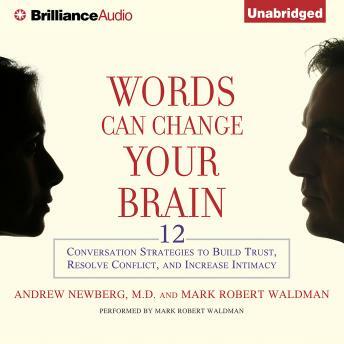 Using data collected from MBA students, couples in therapy, caregivers, and brain scans, Newberg and Waldman have seen again and again that Compassionate Communication can transform a difficult conversation into a deeply satisfying one, literally in a matter of a few minutes. Whether you are negotiating with your boss or your employees, arguing with your spouse, or coping with your kids, Compassionate Communication is a simple and unbeatable way to achieve a win-win dialogue to help you reach your goals. With its clear prescription and proven results, Words Can Change Your Brain will change how you think and speak to virtually everyone.